This was an easy, wonderful dinner. I bought the Tan Tan spice mixture from Savory Spice shop. They were inspired by ras el hanout which is a blend of any type of toasted spices specific to Morrocco. I simply rubbed it on the swordfish and grilled it. The results were fantastic! 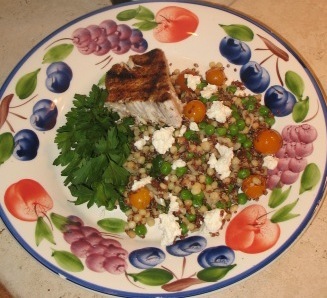 I paired it with a salad of Israeli Cous Cous, peas, cherry tomatoes and red quinoa. Whenever I make any grains, I always cook extra and keep them in the fridge or even freeze them so they are on hand for impromptu side dishes and salads. I topped it with just a bit of creamy French-style sheep’s milk feta. Delicious! Place first 5 ingredients in a large bowl and toss together. Pour on a bit of olive oil and a splash of vinegar and toss agin. Season with salt and pepper. Top with the sliced spring onions and feta. Toss once more, check and adjust seasonings as neccessary, and serve.